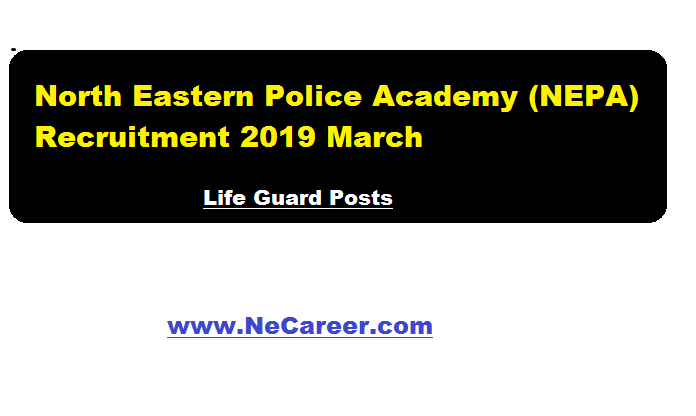 North Eastern Police Academy (NEPA) Recruitment 2019 March | Life Guard Posts :- Welcome to North East India's No. 1 Job Portal NeCareer.com . North Eastern Police Academy has issued a recruitment notification in March 2019. According to the NEPA Recruitment, Application are invited to fill up the post of Life Guard temporarily in North Eastern Police Academy (NEPA) on direct recruitment basis, The post is in the pay Scale & Grade pay (Revised pay scale at 7th CPC pay Matrix Level) mentioned as per details below and allowances will be paid as per Central Govt. Rules. (e) Two years of practical experience as a Life Guard Or Swimming job in a Government or Commercial Organization. Age: Between 18-25 years as on 02nd April 2019 (Relaxable for government servants up to the age of forty years in the ease of general candidates and up to forty-five years in the case of candidates belonging to the SC or ST in accordance with the instructions or orders issued by the central government from time to time. Trade Test Life Guard : The candidates will be tested in practical knowledge Of Life Guard / Swimming. Govt- of India from time to time. Application as per Annexure – I given with the advertisement is to be filled up by the candidates and brought during the recruitment rally as per the date(s) mentioned above. Candidates are required to report with duly filled up the application form, copies Of required certificates (educational qualification, age, caste, technical qualification. experience etc.) and originals Of these copies. The reporting time is 0800 hrs on 2nd April 2019. NO advance application is required/entertained. The recruitment process can be canceled/ postponed/ suspended/ terminated without any prior notice / assigning any reasons at any stage.